The Border Regiment. British Army 1893. Home » The Border Regiment. 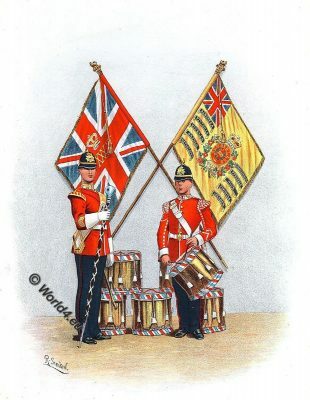 British Army 1893. The Border Regiment was a line infantry regiment of the British Army. It was formed on July 1, 1881, following the merger of the 34th Cumberland Infantry Regiment and the 55th Westmorland Infantry Regiment. After serving in the First and Second World Wars, the regiment was merged in 1959 with the King’s Own Royal Border Regiment. Source: Military Types – No. 71. Supplement to the Army and Navy Gazette, Saturday, November 4, 1893. By Richard Simkin (1840-1926). This entry was posted in 1893, 19th Century, England, Military and tagged British Military Costume, Uniforms on 7/31/17 by world4.